Compost coffee, originally uploaded by mike1727. Composting is a good thing (tm), pretty much all our veg waste, paper towels etc get chucked in a dustbin which I add to the heap once it's full. A couple of weeks ago we had a semi-annual purge of old paperwork which needed shredding and therefore wouldn't go in the recycling. Rashly, I put the lot in the compost- a good 2 bin bags full. This was rapidly followed by a load of kitchen waste and a lawn's worth of grass clippings to try to rebalance the green:brown ratio , in order to avoid a stinky mess of sludge at the bottom of the garden. The Starbucks concessions at work give away their used coffee grounds for composing, so I picked up a couple of bags, mixing coffee into the pile in the hope of getting everything cooking nicely. The following day the compost felt warm to the touch, so I shoved the greenhouse thermometer into the middle of the pile to check...85 degrees F. Not bad. The pile was steaming when I added another six bags last night so I'm doing something right. There's still some way to go before I get to the 150F or so required to kill weed seeds, but it's a good start. 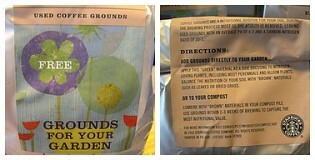 The Starbucks Coffee Compost Test- chemical analysis of soil nutrients in used coffee grounds.